Contrary to its name, the Boston Cream Pie is not a pie but a butter cake with a layer of custard or cream filling. It is finished off with a rich chocolate ganache glaze poured on top and let to drip to the sides. The first Boston Cream Pie was created by an Armenian-French chef named M. Sanzian who worked at Boston's Parker House Hotel in 1856. 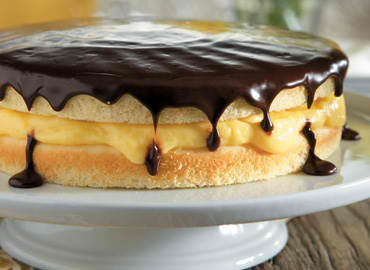 In 1996, the Boston Cream Pie was declared the official dessert of Massachusetts. Pie, cake, or whatever you wish to call it, the Boston Cream Pie is a delicious and truly traditional American treat. Here is an easy dessert recipe for Boston Cream Pie. Preheat the oven to 350°F. Lightly grease a round 8- or 9-inch x 2-inch-high layer cake pan. To make the cake: In a small bowl, mix the flour, baking powder, and salt. In a medium bowl, beat the egg whites with an electric mixer on medium speed until frothy. 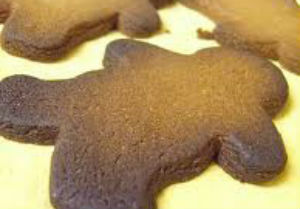 Gradually add 1/4 cup of the sugar, and continue beating until stiff peaks form. In a large bowl with the same beaters (no need to wash them), beat the remaining 1/4 cup sugar with the butter until light and fluffy. With the mixer on low, alternately beat in the flour mixture and milk until smooth. Stir in the vanilla, then 1/3 of the egg-white mixture. Gently fold in remaining egg whites with a rubber spatula until no white streaks remain. Pour the batter into the prepared pan. Bake until a toothpick inserted into the center comes out clean, about 35 minutes. Meanwhile, make the filling: In a medium saucepan, combine the milk and 1/4 cup sugar over medium heat, and bring to a simmer. Meanwhile, in a medium bowl, whisk the egg yolks and remaining sugar until well combined. 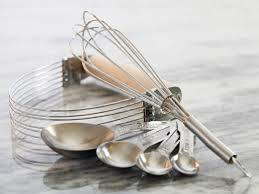 Whisk in vanilla and salt. Whisk in cornstarch, 1 tablespoon at a time, until well blended. While whisking egg mixture constantly, slowly add 1 cup of the heated milk to the egg mixture while whisking constantly. Strain this mixture into milk remaining in saucepan. Continue cooking over medium heat, whisking constantly, until mixture comes to a full boil, about 5 minutes. Transfer the mixture to a medium bowl, and cover the surface with a piece of plastic wrap to prevent a skin from forming. Refrigerate until thoroughly chilled and thickened, at least 3 hours and up to overnight. Make the glaze: In a small saucepan, mix the sugar, cocoa, and cornstarch. Stir in the milk and bring to a boil over medium heat. Cook for about 1 minute, stirring constantly, until slightly thickened. Stir in the vanilla. Remove the pan from the heat and let cool for 20 minutes in the refrigerator. Set the pan on a wire rack to cool for 10 minutes. Turn the cake out onto the rack and cool completely. 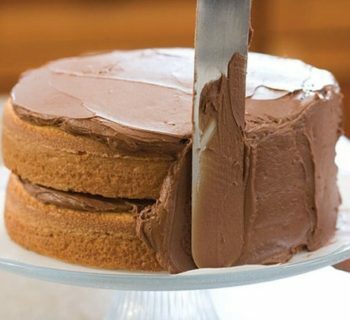 To assemble the cake: With a serrated knife, cut the cake in half horizontally. Place the bottom layer, cut-side up, on a serving plate. Spread the filling over top. Cover with remaining cake layer, cut-side down. Spread the chocolate glaze over the top, allowing the glaze to drip down the sides. Chill the cake for 3 hours, or until the glaze sets.